Using the pencil, draw a wreath around the llama’s head and a scarf around it's neck. Using the Script Liner and Soft Fan with SC-8 Just Froggy, apply two coats to the wreath. Continue over to the sides and back of the ornament. Allow glaze to dry between coats. Using the Detail Liner with SC-73 Candy Apple Red, apply two coats to the scarf. Allow glaze to dry between coats. Using the Script Liner with SC-45 My Blue Heaven, apply two coats between the llama head and wreath. Allow glaze to dry between coats. Using the Detail Liner with SC-15 Tuxedo, outline wreath and scarf. Use SG-403 Red to make clusters of three berries in the wreath. Using the Detail Liner with SC-15 Tuxedo, make leaves coming out from the berries. Use SG-402 White to make stripes in the scarf. 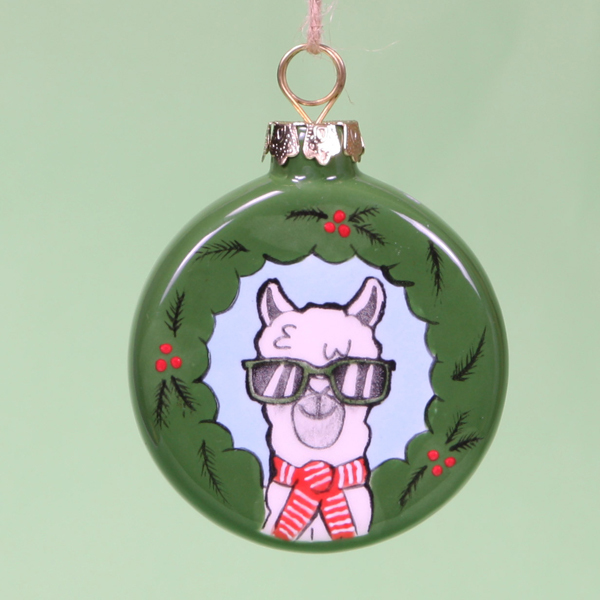 Using the Detail Liner with SC-8 Just Froggy, apply two coats to the rims of the llama’s glasses. Allow glaze to dry between coats.